God’s Chosen Method of Creation? How did this universe come into existence? Was it designed by God, and if so, how did He do it? Did God use “natural” methods to create the universe, or did He create everything supernaturally? These questions are central to our understanding of the purpose of the universe and our significance within it. Fortunately, there are answers. What Does the Bible Say . . . The Creator Himself has given a written record that summarizes His creative acts. Sadly, many people are inclined to ignore what God has said. Instead, they rely on secular philosophy to explain what happened in the past, and it contradicts recorded history and eyewitness testimony. Can you imagine people applying such thinking to other fields of study? What if historians rejected recorded history and claimed that World War I never happened because their philosophy does not allow for the possibility of a world war? Would this be reasonable? Ironically, the one thing the big bang does not explain is the origin of the universe. It is only a story about what supposedly happened afterwards. The cosmic microwave background is much more uniform than was predicted by the big bang model. In the past two decades, astronomers have discovered hundreds of planets orbiting other stars. They are large Jupiter-sized planets orbiting very close to their star—the opposite of what was predicted by secular models. Since the philosophy of naturalism does not allow for anything beyond nature, a naturalist would insist that the universe was created by the kinds of processes currently operating within it. The big bang is based on this critical assumption; that is, the big bang model attempts to describe the formation of the entire universe by processes currently operating within the universe. Stars, planets, and galaxies are all said to have formed “naturalistically”—by the laws of nature currently in operation today. Is it rational or necessary to assume that the universe was created in the same way it operates? Not at all. We can see the absurdity of such thinking by applying it to other objects. A flashlight, for example, operates by converting electrical energy into light; would it be rational to assume that the flashlight was created by the conversion of electrical energy into light? No, it was created by an entirely different process. Most things are. Logically, we can’t necessarily conclude that the universe was created by the kinds of processes operating within it. Naturalism is an assumption—nothing more. Claims that God used naturalistic processes deny what the Creator Himself has said about the creation of the universe. Nonetheless, some professing Christians accept the claim that God used naturalistic processes, including the big bang, to create the universe. They might agree with atheistic astronomers that the stars and planets formed by slow natural processes over billions of years—with only one exception, that God’s hand directed these processes. Unfortunately, such views deny what the Creator Himself has said about the creation of the universe, as we will explore in the rest of this article. In many cases, we can write equations to describe the consistent predictable behavior of the universe. These equations, or “laws of nature,” are descriptions of the way God upholds the universe in the present. However, these laws of nature cannot describe how God created the universe. Like the flashlight, the universe was not created by the same processes that operate within it today. God makes clear in Genesis 2:2 that He changed His mode of operation by the seventh day, when He ended His work of creation. So God is no longer acting today in the same way He was during the Creation Week. He is no longer speaking new animals, plants, and stars into existence. Creation was a supernatural event, which cannot be described by today’s laws of nature. The Bible tells us that God created heaven, earth, and everything within them in the span of six days ( Exodus 20:11 ) and rested on the seventh day. This is the basis for our work week ( Exodus 20:8 ). In contrast, the big bang model claims that the universe and earth formed over billions of years. Genesis tells us that God created the stars on the fourth day—three days after the earth was created. In contrast, the big bang model claims that stars existed billions of years before the earth. The Bible tells us that the earth was made from water ( 2 Peter 3:5; Genesis 1:2–9; Psalm 24:2 ), but the standard secular model teaches that the earth began as a molten blob. The big bang model is really a story about the alleged past. But few people realize that it is also a story about the alleged future. The big bang model (in the most-accepted variation) claims that our universe will expand forever. At some point, all usable energy will be converted to a useless form, and life will no longer be possible. It’s a bleak outlook and one that is vastly different from the Bible’s description of the future. Scripture teaches that there will be a resurrection, judgment, and then a restoration of paradise. Clearly, the Bible is not compatible with the big bang. What Does Science Say . . .
What about the Scientific Evidence? Most people don’t realize that the big bang is not only bad theology but also bad science. Is the big bang the same kind of science that put men on the moon or allows your computer to function? Not at all. The big bang isn’t testable, repeatable laboratory science. It doesn’t make specific predictions that are confirmed by observation and experimentation. In fact, the big bang is at odds with a number of principles of real operational science. Let’s explore some of these. Most people know something about magnets, like the kind found in a compass. These magnets have two “poles”—a north pole and a south pole. Poles that are alike repel each other, and opposites attract. A “monopole” is a hypothetical massive particle that is just like a magnet but with only one pole. So a monopole would have either a “north” pole or a “south” pole, but not both. Particle physicists claim that the high temperature conditions of the big bang should have created magnetic monopoles. Since monopoles are predicted to be stable, they should have lasted to this day. Yet, despite considerable searching, monopoles have not been found. Where are the monopoles? The fact that we don’t find any monopoles strongly suggests that the universe never was that hot. This indicates that there never was a big bang. But the lack of monopoles is perfectly consistent with the Bible’s account of creation because the universe did not start at extremely high temperatures. Another challenge to the big bang is the “baryon number problem.” The big bang supposes that matter (hydrogen and helium gas) was created from energy as the universe expanded. However, experimental physics tells us that whenever matter is created from energy, such a reaction also produces antimatter. Antimatter has similar properties to matter, except the charges of the particles are reversed. (So, whereas a proton has a positive charge, an antiproton has a negative charge). In any reaction where energy is transformed into matter, it produces an exactly equal amount of antimatter; there are no known exceptions. The big bang (which has no matter to begin with—only energy) should have produced precisely equal amounts of matter and antimatter. Thus, if the big bang were true, there should be an exactly equal amount of matter and antimatter in the universe today. But there is not. The visible universe is comprised almost entirely of matter—with only trace amounts of antimatter. This devastating problem for the big bang actually is a powerful confirmation of biblical creation; it is a design feature. God created the universe to be essentially matter only—and it’s a good thing He did. When matter and antimatter come together, they violently destroy each other. If the universe had equal amounts of matter and antimatter (as the big bang requires), life would not be possible. The big bang model by itself can account for the existence of only the three lightest elements (hydrogen, helium, and trace amounts of lithium). This leaves nearly 90 of the other naturally occurring elements to be explained. Since the conditions in the supposed big bang are not right to form these heavier elements (as big bang supporters readily concede), secular astronomers believe that stars have produced the remaining elements by nuclear fusion in their cores. This is thought to occur in the final stages of massive stars, as the stars explode (supernovae). These explosions then distribute the heavier elements into space. Second- and third-generation stars are thus “contaminated” with small amounts of these heavier elements. If this story were true, then the first stars would be comprised of only the three lightest elements (since these would have been the only elements in existence initially). Some such stars1 should still be around today since their lifespans are computed to exceed the time that has elapsed since the big bang. Such stars would be called “population III” stars.2 Amazingly (to those who believe in the big bang), population III stars have not been found anywhere. All known stars have at least trace amounts of heavy elements in them. It is amazing to think that our galaxy alone is estimated to have over 100 billion stars in it. Yet not one star has been discovered that is comprised of only the three lightest elements. 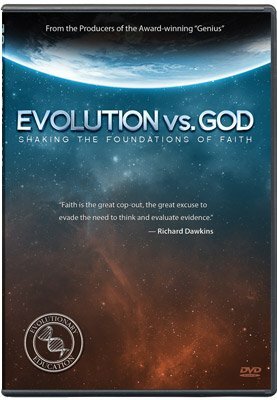 The big bang is not compatible with the Bible and is not good science. 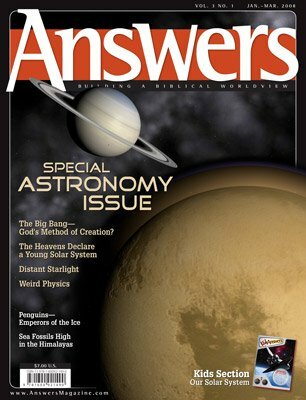 This collector’s quality issue is a special, extended 112-page issue about astronomy, covering the big bang, black holes, space exploration, and much more! Small stars (red main sequence) do not use up their fuel quickly. These stars theoretically have enough fuel to last significantly longer than the age of the universe, as estimated by big bang assumptions. If a star has a very small amount of heavy elements, it is called a “population II” star. Population II stars exist primarily in the central bulge and halo of spiral galaxies, in globular star clusters, and in elliptical galaxies. If a star has a relatively large amount of heavy elements (like the sun), it is called “population I.” These stars exist primarily in the arms of spiral galaxies. The hypothetical pop III star would have no heavy elements at all.